Pesto Pasta Salad with Grilled Chicken, Healthy Weekly Menu Plan. 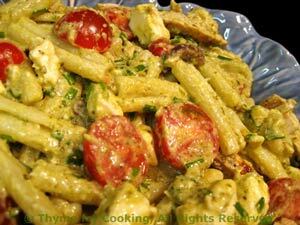 This is a variation on the traditional Pasta with Pesto Sauce, giving it a bit of Greek flair. It goes together quickly with the leftover, grilled Cornish Hens... or grilled chicken breasts. Note: If using leftover chicken, cut into bite-size pieces and add to pasta.